Summer is nearly upon us, which means it’s time to break out the boardies and rashies. 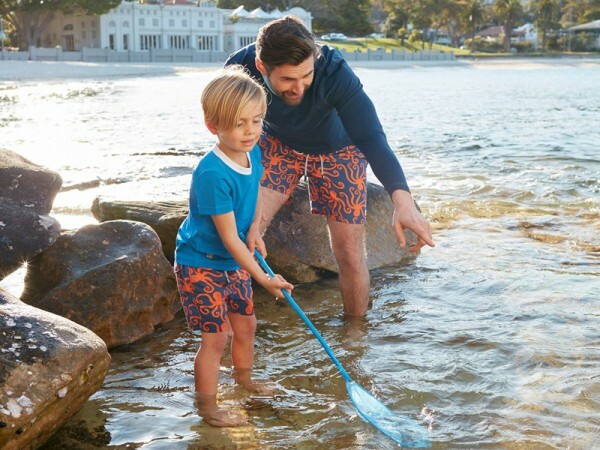 And with the retro inspired range from local Aussie swimwear brand Tom & Teddy, boys can now match up with their dads in style. Each piece features quick drying microfibre with 100 per cent cotton mesh linings, durable double stitching, elastic waist, as well as resistance to saltwater and chlorine. The rash tops are a relaxed t-shirt style, and come in short or long sleeve. Both lines are certified UPF50+ for sun protection. Comfortable enough to wear all day long, in and out of the water. What more could a kid (or dad) want? I know I want a pair. Sizes cover little guys, starting at 12 months and go all the way up to XXL for big boys (men). Shorts are $54.95 (men,$99.95), while rashies start from $44.95 for kids and $69.95 for men, along with free shipping from the Tom & Teddy site.